Room to Read is an organization with a big vision: A world where all children can pursue a quality education and contribute to their communities and the world. One of the main ways Room to Read works to achieve this goal is by establishing libraries so that kids have access to books. Room to Read also publishes children’s books in a variety of languages to ensure that libraries have books written in local languages. 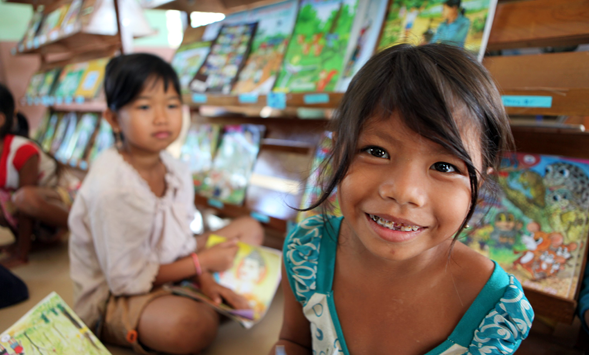 So far, Room to Read has established and helped maintain more than 12,000 libraries in 10 countries in Africa and Asia. You can learn more about Room to Read’s efforts to establish libraries here. Room to Read has chapters in the United States, Canada, Asia, the Middle East, Australia and Europe, so there is a good chance that Room to Read has a chapter near you. You can support Room to Read’s efforts to establish libraries by donating money to their Room to Dream campaign. Alternatively, you can support all of Room to Read’s program areas, which include supporting teachers teaching kids to read, funding school construction, and working towards gender equality in education. While Room to Read does not accept used book donations, those of you in the United States can donate used books to Better World Books. Better World Books will sell your used books and donate the proceeds to Room to Read upon request.